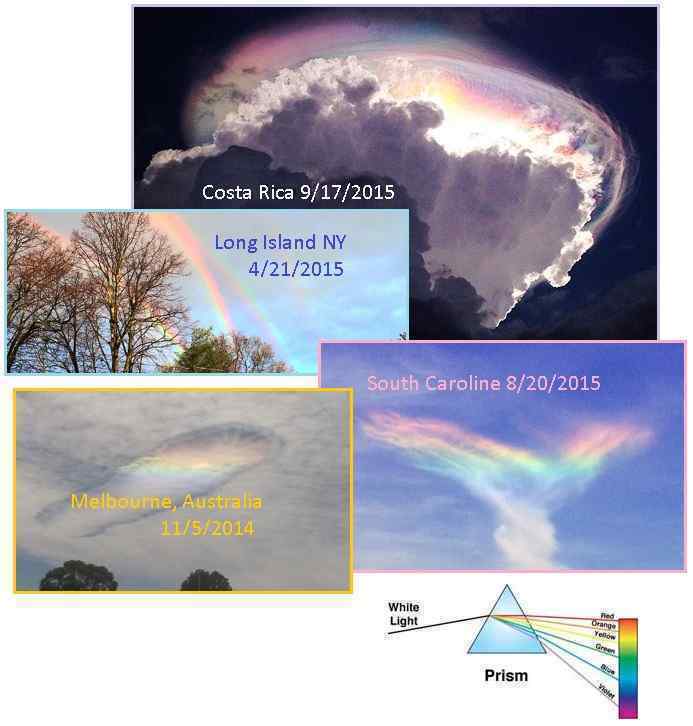 Another weather phenomena it seems that could be related to Planet X? May I ask the Zetas if this is due to EMP? or petro chemical residues in the upper atmosphere? [and from another] Will zetas comment? [and from another] https://m.youtube.com/watch?v=jAcAMfwBRZY&feature=youtu.be [and from another] http://www.wnd.com/2015/09/end-of-times-cloud-awes-costa-rica-witnesses/ [and from another] http://abcnews.go.com/US/mysterious-iridescent-end-times-cloud-phenomenon-spotted-costa/story?id=33834206 An iridescent, multi-hued cloud phenomenon was recently spotted in Costa Rica skies. The spectacle in the sky was reported on in numerous cities including, San Jose, Parrita, Pavas, Escazu and Hatillo. The colorful luminescence is caused by the sun's light being refracted by water droplets and ice crystals in the cloud, said, Eladio Solano, a meteorologist with Costa Rica's National Meteorological Institute. September 17, 2015 [and from another] http://abcnews.go.com/US/beachgoers-snap-stunning-photos-rare-fire-rainbow-south/story?id=33209513 A dazzling "fire rainbow" lit up the sky in South Carolina, stunning onlookers who scrambled for their cameras to snap the rare phenomenon. August 20, 2015 [and from another] http://abcnews.go.com/US/quadruple-rainbow-photographed-york-rainstorm/story?id=30477035 This morning, the sun came out -- along with a quadruple rainbow! Amanda Curtis spotted the magnificent phenomenon from the Long Island Rail Road station in Glencove. While the primary rainbow is formed by direct sunlight passing through raindrops at a proper angle, the other three rainbows are formed by reflections of the sun, usually from calm water, according to the National Center for Atmospheric Research (NCAR). These other rainbows are known as reflection rainbows. April 21, 2015. [and from another] http://www.latest-ufo-sightings.net/2014/11/spaceship-looking-cloud-rainbow-colour-causes-panic-alien-invasion.html A mysterious cloud with rainbow colour appears strange for Wonthaggi residents who witnessed it. The village is located 130 kilometres outside of Melbourne, Australia. November 5, 2014. Thought being billed as an “End of Times” phenomena in Costa Rica, this rainbow lit hole in the clouds is nothing new since Nibiru, aka Planet X, came to town in 2003. The Costa Rica display combines several phenomena, however, thus hitting the news. Rainbows are nothing more than light rays bent by water in the clouds. The angle from the light source (the Sun) to the eye of the recipient changes as the distance increases and thus as with light being shown through a prism the color changes. The multiple rainbows seen recently, or rainbows seen in unusual places, are due to the addition of grease in the atmosphere, as the tail of Nibiru is greasy. It is for this same reason that halos around the Sun or Moon have increased lately. 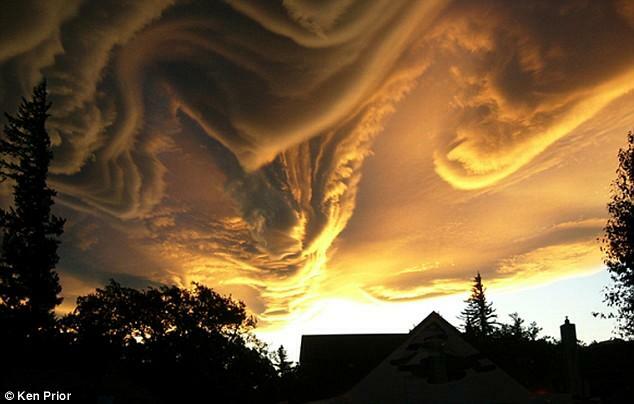 The Earth wobble has produced numerous atmospheric phenomena, undulating wobble clouds and incomplete tornadoes that make holes in clouds. The attention being given to the Costa Rica cloud formation is due primarily to the pending and very pregnant announcement admitting the near presence of Nibiru. This is beyond a subliminal hint, this is a broad statement, especially for Central America which will be crunched during the increasing 7 of 10 plate movements and will be doomed during the Pole Shift. Dark clouds are not new. A break in heavy clouds showing Cumulonimbus clouds above is not new. Rainbows are not new. But the announcement, about to happen, will be new. In the last week there is a lot of activity around Syria, mainly because Russia is increasing its military presence there. President Putin met with several leaders of the Middle East - Palestine, Turkey, Israel and earlier Saudi Arabia. Besides there are some contacts between the military and the intelligence services of Russia and the USA. For the first time in many years Russia sends a significant amount of its military and weapons to Syria. Many became nervous. What is the reason? This is because of the threat to the Assad regime on the part of the rebels, or Russia decided to take an active part in the fight against ISIL? Or someone wants to draw Russia into the conflict, also as wanted to draw Iran? We have explained in the past how Israel tried to frame Syria for chemical weapons use, a fact that is only reluctantly admitted by the West. Where Middle Eastern dictators are not the ideal leaders, removing them often brings more turmoil as the invasion of Iraq has shown. Saudi Arabia is more brutal to its citizens than Syria but is considered an ally of the West so is excused. Meanwhile, because the Bush administration destabilized Iraq in their greed to control the oil in the Middle East, ISIS emerged. Now the entire Middle East is in a type of civil war. Turkey, a US ally, attacking the Kurds who are the best fighters against ISIS. If the US arms the Kurds, Turkey objects, as they consider the Kurds terrorists fighting against the establishment in Turkey. Sunni and Shia are different Muslim sects, and do not cooperate with each other. Saudi Arabia is Sunni, refusing to fight ISIS which is also Sunni, while Iran which is Shia engages them in Iraq. Iran is considered an enemy by many in the US establishment, who refuse to consider them an ally. Israel, who buys many US Congressmen, wants Iran annihilated. Why is Russia getting involved at this time? Obama is crippled by existing US alliances in the Middle East. It cannot arm the Kurds without inflaming alliances with Turkey. It cannot encourage Iran without inflaming Israel and its allies in Congress. Saudi Arabia, a staunch ally of the US, has turned its back on requests that they engage ISIS. Putin is not crippled in this regard. His assists to Assad in Syria, in the fight against ISIS, will help everyone currently fighting ISIS. It will mean the turning point. It will mean the horrendous migration of refugees heading to Europe will stop, and turn back.